Not what you would guess; the German equivalent is trocken or halbtroken: wines are produced in the coolest years when grape ripeness doesn't achieve full maturity. The wines are low in alcohol, light and easy to drink despite having high natural acidity. Don't expect these wines to age well for more than a few years. Sensory evaluation term for wine with a taste or smell reminiscent of soil, mushrooms or mustiness. Laboratory apparatus used to determine the alcohol content of a wine. It measures the precise boiling point of the wine; then, taking into consideration the atmospheric pressure at the time, the analyst determines the alcohol content from the relative boiling points of pure alcohol, water and the wine. (The boiling point of any wine is always somewhere in between that of pure alcohol and pure water since wine itself always contains both). German word for "Noble Rot", or Botrytis cinerea. All the countries making up the EC. European Economic Community all the nations of Europe taken together (as if comprising one nation). The residual albumin obtained by discarding the yolks from eggs. Used in fining red wines during or after barrel aging to remove excessive (and usually bitter) tannin. 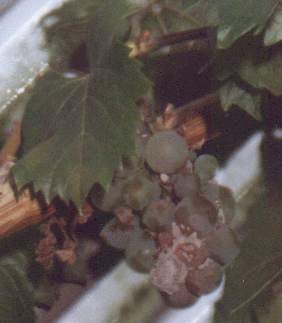 white Grape resulting from the crossing in 1929 at Geisenheim of Riesling and a Sylvaner clone. Many consider it second only to the Kerner grape-cross as a frost-resistant Riesling type substitute for the better known Muller-Thurgau. Mild acid content discourages aging. Claimed to have excellent Riesling grape similarities in taste. A vine individually trained to a single stake . Used on very steep slopes such as the Mosel. ice wine which is wine harvested when minus six degrees Celsius so the water content remains frozen and the wine there fore becomes sweeter and more concentrated. (white grape) Also known as the Weisser Silvaner. This white wine grape variety is of ancient origin (originally planted by the Romans in the 4 th century) it is mostly found in small pockets in the Mosel-Saar-Ruwer region mostly in the Saar, used to produce a traditional dry, sparkling Sekt. It is high yielding but has a neutral flavour. There are about 1000ha planted. The science and technical study of winemaking. Proteins occurring in all plant and animal tissue which act as organic catalysts to control the reactions which take place during metabolism. The reason yeast produces alcohol from sugars in grape juice, turning it into wine, is that yeast produces enzymes which catalyze and control the reactions involved. Whether or not a given enzyme occurs in a given organism is determined by that organism's genetic makeup. Fruity wines with natural sweetness are denoted by the traditional Prädikats A site’s absolutely finest, narrowly demarcated parcels with discernible terroir qualities.Designated grape varieties and taste profiles. Maximum yield of 50hl/ha. Selective harvesting by hand. Minimum must weight equivalent to Spätlese. First release on 1 September the year after harvest for white wines, red wines a year later. On a label this term means estate bottled. A method of training small fruit trees and grapevines in which the vine or tree is "flattened" by tying all the shoots and branches outwards from opposite sides of the trunk. Most of the common methods of vine trellising in use today are variations of the espalier. A chemically-specific class of aromatic flavour compounds which give fruits, juices and wines much of their "fruitiness." The type of alcohol produced by yeast fermentation of sugar under ordinary conditions. The primary alcohol in alcoholic beverages is always ethanol. A tax placed on home produced products, as opposed to imported goods. The primary (alcohol) tax on beer, wine and spirits, is an excise duty.